1/ Tailored romance meets contemporary glamour in this sophisticated bedroom dressed in complementary hues of glamorous pinks and dusty blues. 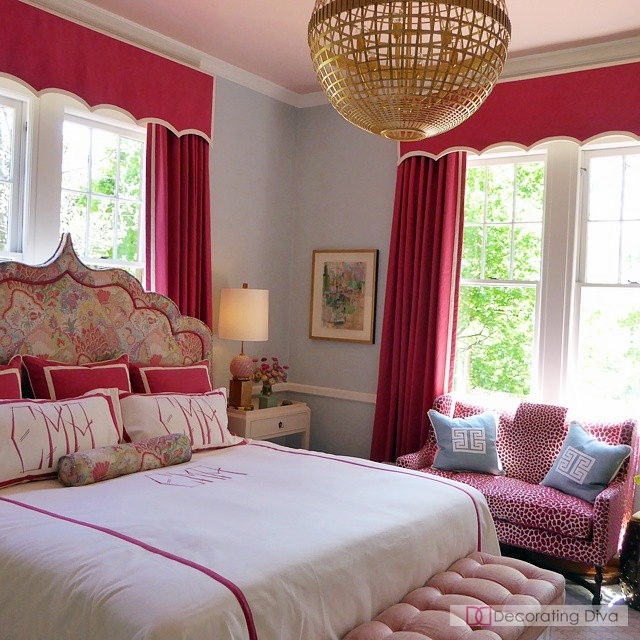 Bedroom design by Cathy Austin of Catherine M. Austin Interior Design. 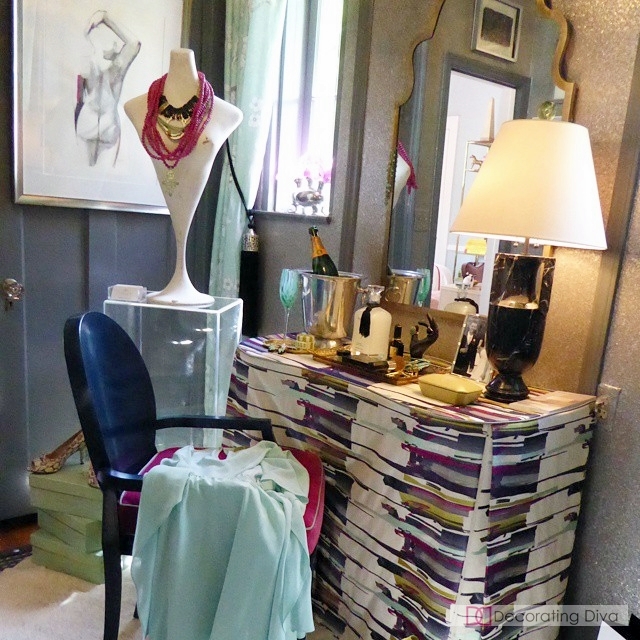 2/ Kara Cox of Kara Cox Interiors designed a glamour-filled dressing room evoking memories of the famed dressing rooms of 1950s Hollywood leading ladies such as Rita Hayworth, Elizabeth Taylor, Ava Gardner and Sophia Loren whose spectacular and luxurious off-screen jet-setting lives rivaled their silver screen portrayals. 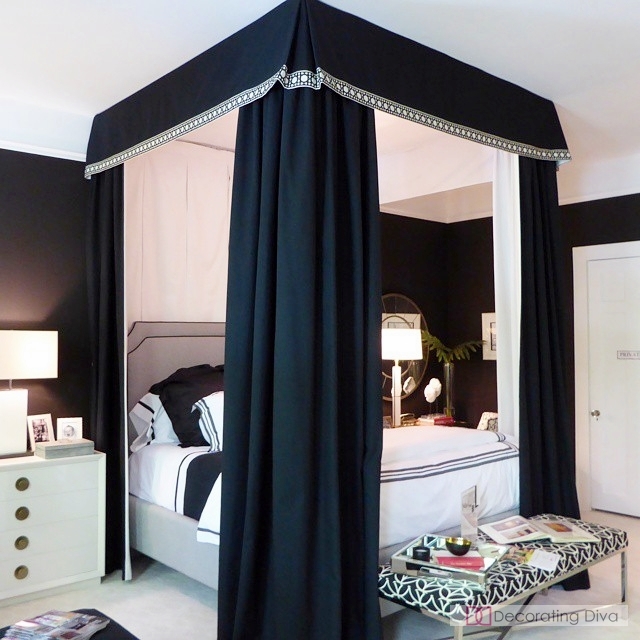 3/ Dramatic black and white flair combine with the timeless elegance of a tailored canopy bed to form the attention-getting focal point of this master bedroom designed by Libby Langdon of Libby Interiors, Inc.
4/ The artist’s retreat designed by Leslie Moore of L. Moore Designs inspires creativity to bubble to the surface. 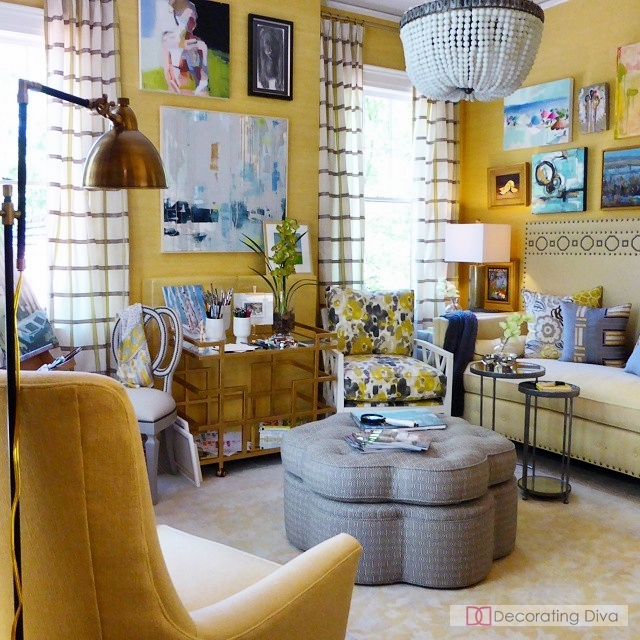 This bright, cheerful, and inviting space designed in a spectrum of welcoming yellows accented with blues is the perfect in-home art studio and artist lounge. 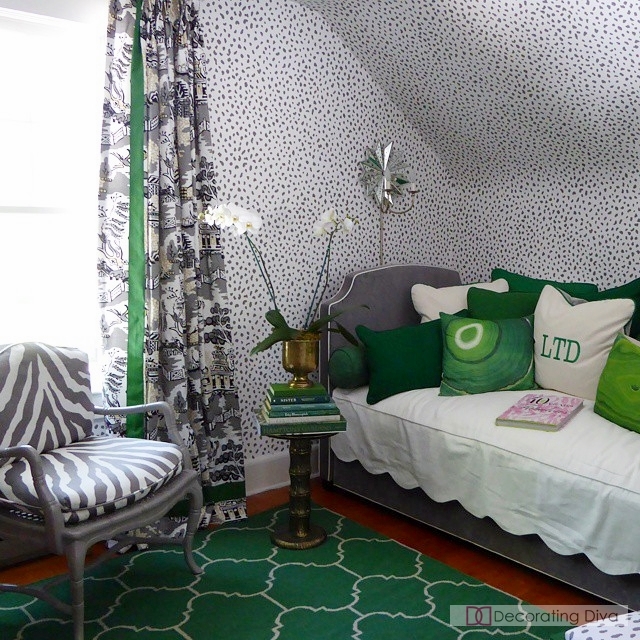 5/ Serene guest room in monochromatic tones of green accented with grays, makes for the perfect retreat from the madcap world. 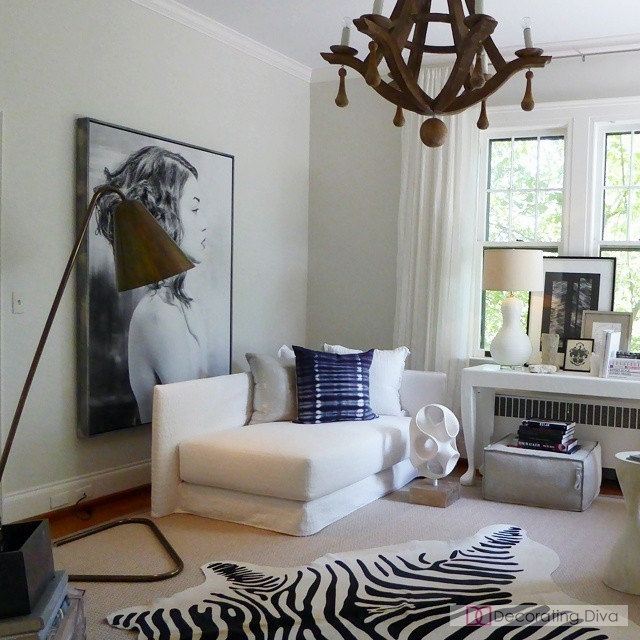 Design by Lance Jackson and David Ecton of Parker Kennedy Living. 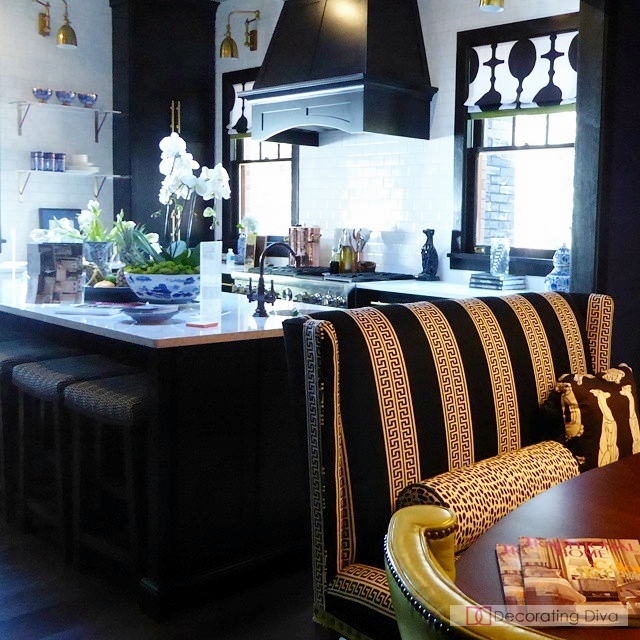 6/ Lisa Herring Mende of Lisa Mende Design masterfully blends 1920s’ inspired Art Deco patterns and style with modern kitchen innovations to create a casual, contemporary space that feels elegant and is rooted in tradition. 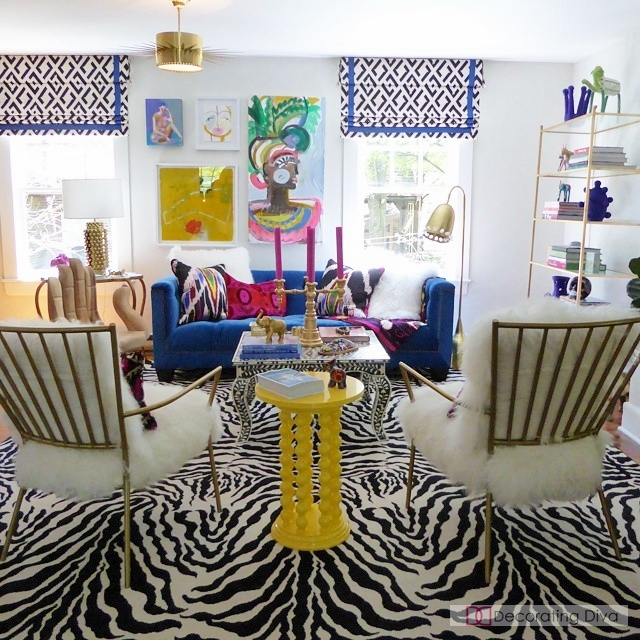 7/ Contemporary Bohemian chic meets International art collector style in this vibrant, color-saturated, glamorous art gallery haven room design by Holly Hollingsworth Phillips of The English Room. 8/ Luxe sanctuary designed by Lisa Sherry of Lisa Sherry Interieurs captivates with its embracing elegance, neutral color scheme, and cozy comfort.